Here’s another six sentences from Foreshadow! My face burned, and I felt thankful the trees were hiding the moon. “Oh, and are you going to be the one to treat me better? Are you saying you could treat me how I deserve to be treated?” I retorted. He fell silent. His emerald eyes warmed as they bored into mine. “I could,” he whispered. I’m back with six sentences from a current work in progress, tentatively titled Lady Lost! He waved his hand through the air. It shimmered and shifted, forming a sort of void. I could make out some sort of light on the other side. “Time to go, My Lady. Good luck.” He shoved me forward, toward the light. Want more? I’ll be back next Sunday with another six sentences! Want to read six sentences from other authors’ works? Visit http://sixsunday.com/ for the full list! Here’s another six sentences from Overshadow, book two of The Shadow Imperium! Growing desperate now, my mind reeled while I tried to figure out a way to escape him. He was infinitely stronger than me and Logan wasn’t around this time to save me. A crackling energy formed around my palms. I didn’t stop to question it. I pushed him once more, putting all my force behind it. He flew across the room and crashed into the opposite wall. Want more? Check back next Sunday for another six sentences! Want to read six sentences from other authors’ works? Head over to http://sixsunday.com/ for the complete list of participating authors! Since I finished writing Overshadow, book two in The Shadow Imperium series, yesterday, I thought I would share six sentences from it. I didn’t know angels could bleed. Blood ran freely from a gash on his otherwise unmarred forehead, tracing a crimson river across the plane of his cheekbone before finally dripping from his chin. The sand beneath him was stained red, although it looked off in the night. His dark hair was matted and stiff where the blood had colored it as well. Want more? Check back next Sunday! Nothing had been right since I left Vegas. Nothing had been right since my mother had died. I cut that thought off. It still hurt too much to think about her. I missed her, yet I blamed her. If she hadn’t died, I wouldn’t be stuck here, in a place I didn’t like, with people I didn’t like. Here’s six sentences from Foreshadow, book one of The Shadow Imperium series! I found myself running again, but the setting had changed. I wasn’t at the beach this time. I stood in a long hallway, and it seemed familiar for some reason. The fog hung low in the hall, surrounding me. Fog inside a building? It didn’t make sense, but in horror, I watched as it pulled at my clothes, twisting around my legs. 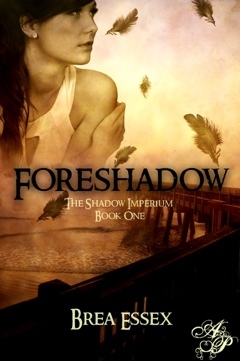 Foreshadow is available now from Amazon, Barnes and Noble, and the Astraea Press website!